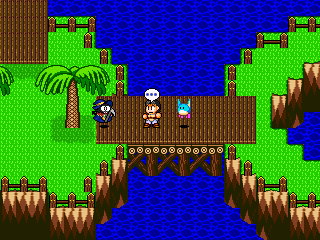 Monster World RPG ver. 1.1 is out now ! ! ! 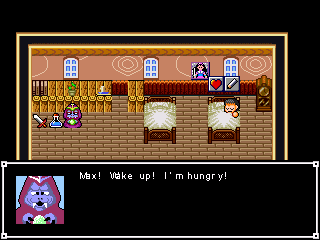 Monster World RPG is a fan game inspired by the Monster World (Wonder Boy in the US) series, made by SEGA and Westone for Arcade, Sega Master System and Genesis. It's no a sequel, prequel or remake, but a brand new game in rpg style instead of platform. 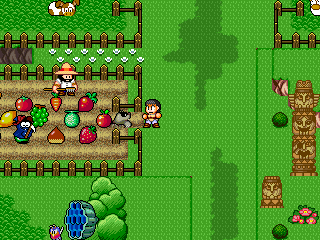 The game you can download here is the COMPLETE VERSION, a complex rpg game developed with RpgMaker2003 with many different monsters. Along with Max, the main hero, there's other five characters, which can be inserted or removed from the team as you wish. Also there's many sidequests: all of them are kept in a special “book menu”, so you won't forget them. 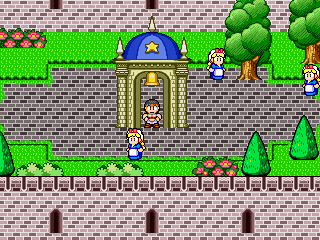 The main hero also can be customized with different spells, magic weapons, and more. The full version of the game is only the one you can download form its official website: the other version you can find around the net are old incomplete demos. The place is Aqua Kingdom. The hero of this story, Max, lives in the Valley of Peace near Purapril, the capital. Since his friend Shion left for Purapril to do his knight duties, Max life got boring. A morning while hunting in the woods he found a strange creature he never seen before. Unsure about the creature's "taste" he decided to avoid making it his meal, but keep it as his pet. Now that he has a "party member" he decide that's time for him to leave the valley for a more exciting life. He decide to go to Purapril to meet again his friend Shion but while attemping to enter into the city two guards block his way forcing him to travel somewhere else. Where will Max go now? 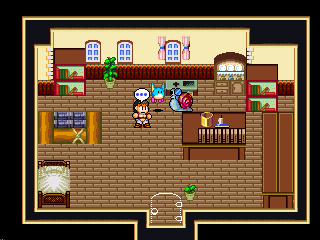 Will Max be able to enter in town? And what is happening there? Unbeknowst to him his "adventurous life" has already begun . . . The hero of the game. He's a fighter, so he won't learn new skills by leveling up. Instead, he gets new skills by learning them from other people, by equipping certain equipment or getting special items. Pepe is a strange animal that no one knows its species or place of origin. He can only say “pepe”, so Max gave him this name. His species is unknown so he's considered an “odd pet”. Pepe starts with some skills and learn more as his level increases. He can't use any equipment, but only attacking with his claws. Priscilla is a small fairy from Alsedo, the fairy village. She lives with Eleanora, the fairy queen. Being a fairy she mainly knows healing and assist spells. Shabo is a death god, wich is actually a species, not a deity. Shabo knows many spells, mainly attack spells but also some assist spells. If used wisely he can be a great ally. Hotta is a dwarf from Lilypad, the dwarf village. He can't use spells but istead uses special skills. He's a very strong character and can greatly damage the enemies. His only weakness is that he's the slowest character. Junior is a baby dragon from Begonia. He may be just a baby, but due to his dragon lineage his power is great. He's almost as strong as Hotta and is faster, but has lower resistances and less skills. Fernando - main programmer, tiles & faceset designer, music & sound, beta tester, final scripter. MAX TEAM has also many friends who gave help listed in the credits of the game. • One thing that I hate of rpgmaker games are the charasets: they are to small and so the characters looks too much unexpressive. So we used the characters slots at their limits and sometimes for bigger characters we used more than a slot. • In rpg usually you got experience point or buy equipement in order to increase your party stats. This can be entertaining at the beginning, but later it becomes repetitive. For this reason, even if we kept the experience and equipment system, we decided to put in the game a way to customize your hero to give him different skills and map abilities in order to reach different zones (like castlevania or metroid). • Another weak points of rpgmaker videogames is that being them "free games" there's no manual or other things. Plus they lacks menu that usually are present in professional games. MWRPG has an online guide. • Last, a common rpg game engine will become rapidly repetitive and unappealing. 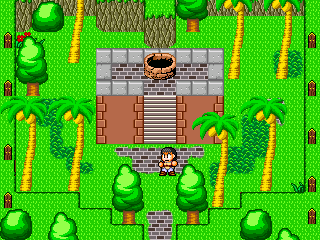 Due to this MWRPG has many platform elements and minigames. • In order to advance in the game is more important to find secrets and upgrade items more than levelling up: in this way you have not to waste an entire day in fighting monsters. FINAL WORS: READ PLEASE !!! Please feel free to comment the game on the forum as much as you want. Thanks in advance and enjoy our game!!! it’s Massimo here, author of Monster World RPG and member of the game developer duo known as “MAX TEAM”. After a few months since the release of our well-received fan-videogame “Monster World RPG”, I’m here to give you some info. Me and Fernando, the programmer of the game, are already working on the release, scheduled to happen within the next year, of the enanched version of our game, a “fixed” version created thanks to the beloved feedbacks many players send to us during the last months. Usually it is me who "follow" directly our advertising activities on the social networks and so I take this chance to thanks our supporters again and also to give a special thanks to Fernando who, in thoose many years of developing the game, went through the “boring”part of development (a.k.a. 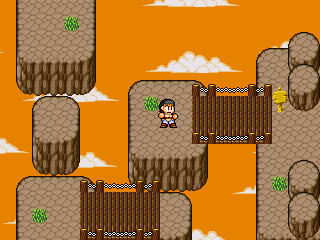 “programming”) while I was doing the creative part by writing the story and debugging the game again and again (a.k.a. “play the game”). 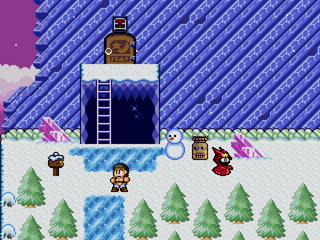 If he did not decided to take over the project along with me sometihng like 10 years ago, today there won’t be any “Monster World RPG” for you to play. 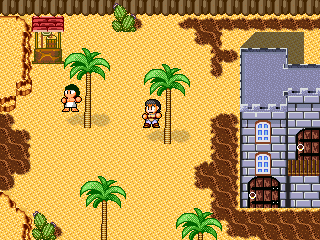 As you probably know, I originally write the whole story (with minor differences from its final version) and had created the first demo of the game after I had ripped and customized many sprites from the original series of games from which our own took inspiration. I believe setting the story, make the storyboard, debugging (again and again) and advertising the game it is an important work: but when you are into videogame creation, if there’s nobody which do the “programming thing”, there is nothing to release to the public!!!). Thanks again for your support to everybody. I play a lot, try to play it. I like this game. Other than wishing to you all for an happy new year, we would like to inform you about some news regarding the updated version of the game actually in the works to be released next year in august. We would like to credit in the new version who of you was able to complete fully the game. Tell us also if you want to be credited by your full name, by a nick name, or both. "Hello everyone, today we have a special interview with the creators of Monster World RPG; an incredible fan game and passion project based on the Wonder Boy series created by Ryuichi Nishizawa. We have with us the lead developer; Massimo and the co-developer; Fernando. In honor of the 30th anniversary of Wonder Boy, I will be asking 30 questions based on the game's development(which also includes questions unrelated as well). Without further ado, let's get started shall we?" The problem might very well be about CLEARTYPE, a technology meant to improve clarity of texts in LCD screens, but it seems to get in conflict with Rpgmaker games. 3-Click on “Turn on ClearType” to deactivate it, then click Advance and choose a text format you want (keep in mind the one it was on before). Your regular computer font might look a bit weird, but you can always go back to activating ClearType and choosing the old format. "Monster World RPG (stream) - PEPE!" An updated version is soon to be released within october and november. This new version will contain many bug fix and improvements thanks to the numerous feedback we received from players. There are eleven journal entry about the new release in the game facebook official page which contain even more information and screenshots. When the new version will be ready this post will be updated for you all. Since many asked after the last journal entries, here’s a complete list of the new features of the soon to be released new version of the game. - several smaller bugs were fixed, especially in the second half of the game. Other than this new features, the game will be available for download along with other resources file and a read me with a troubleshootin section which will help people who encounter minor problems in making the game works on their home computer. - WonderBoy - The Sword of Legend (complete game). This is the last journal entry before the release, so there will be a little periodo of silence in order to proprely complete the “upgrade” and proprely upload and announce the game. Basic download: contains only the full-playable current (updated) version of the game and the resources needed for troubleshooting (163 MB RAR ARCHIVE). 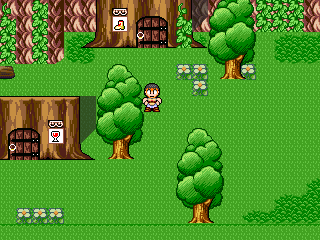 - WonderBoy - The Sword of Legend (original and complete playable game by "The Cyberlynx". Page created in 0.507 seconds with 25 queries.